There are plain plasterboard fixings and there are Grip-It fixings. These ultra strong plasterboard fixings are crafted from a revolutionary design that provides a strong fix when hanging anything that weighs up to 400lbs. Our innovative product that took the UK world by storm is as seen on tv and the winner of the BBC show Dragon's Den. The patented design is masterfully engineered to provide a safe and secure wall fixings that works 100% of the time so that you can confidently hang your flat screen TVs without the fear of falling down or busting apart. 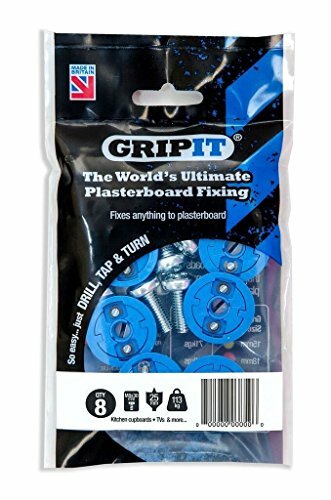 "THE WORLD'S ULTIMATE PLASTERBOARD FIXING" There are plain plasterboard fixings and there are GripIt fixings. These ultra strong plasterboard fixings are crafted from a revolutionary design that provides a strong fix when hanging anything that weighs up to 400lbs. Our innovative product that took the UK world by storm is as seen on tv and the winner of the show Dragon's Den. The patented design is masterfully engineered to provide a safe and secure wall fixings that works 100% of the time so that you can confidently hang your flat screen TVs without the fear of falling down or busting apart. It has 3 Unique gripping system that creates a vice- like hold in plasterboard walls. All you need is just a simple DRILL, TAP and TURN for quick installation. Once drilled, the unique backing wings expand inside the cavity to provide a secure anchor, creating a strong tight grip. Very easy and quick to install. Simply Drill, Tap and Turn on any drywall or hollow wall for ultra fast installations. Includes quick adjustment feature by turning the 2 small screws to the left. Each screws come in universal sizes, and with an added drill bit. It is also compatible with any standard size screwdriver. Made from heavy duty and durable metal materials to ensure that it lasts longer and to avoid chipping or loosing the thread. Removable and reusable screws that are ideal for Dot and Dab wall installations. Suitable for all plasterboard types (1/2" to 5/8") without the need for battening or additional anchor points. It also works on insulated plasterboard types. If you have any questions about this product by Grip-It, contact us by completing and submitting the form below. If you are looking for a specif part number, please include it with your message.